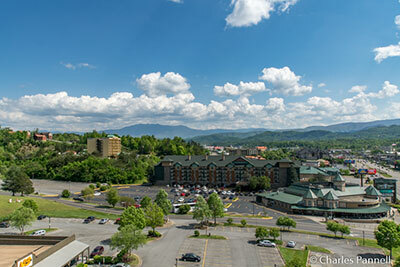 Located just five miles north of Great Smoky Mountains National Park, Pigeon Forge is literally surrounded by beauty. And although it’s easy to lose sight of the natural side of things while you’re enjoying a show or visiting a museum, you can still get a peek at Mother Nature if you know where to look. With that in mind, here are five places where you can catch a bird’s eye view of the surrounding natural beauty in this Tennessee mountain resort. 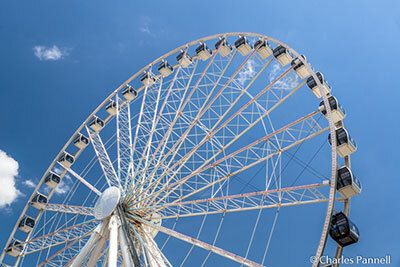 Located in the newest development in Pigeon Forge, The Great Smoky Mountain Wheel tops the “good view” list, largely due to its size and location. The 200-foot tall wheel offers visitors an excellent view of nearby Mt. LeConte; and although the view is great from anywhere on the wheel, it’s especially impressive from the top. Access is good at the wheel too, with ramp access to the air conditioned glass gondolas, folding seats, and plenty of room for a wheelchair aboard. And although the view is stunning all day long, it’s especially scenic in the late afternoon, when the sun shines directly on the mountain. After you’ve had your fill of fun and selfies with the 108 celebrity figures in the Hollywood Wax Museum, save some time to steal away to the third-floor observation deck. Not only is this a good vantage point for a view of the Smoky Mountains, but it’s also a nice spot for a closer look at the great ape that clings to the building King Kong style. Although this prime vantage point is easy to find, most visitors completely pass it by, as it’s tucked away near the elevator. There’s level access out to the deck, which has plenty of room for a wheelchair; but only stair access to the upper viewing platform. Still the view is great from the third floor. Try and schedule your visit in the afternoon though, as the morning sun can get pretty intense on the deck. An often overlooked spot for a good view is located at one of Pigeon Forge’s newest additions — Dollywood’s Dream More Resort. And you don’t have to go far to find the view either — just walk in the front door. 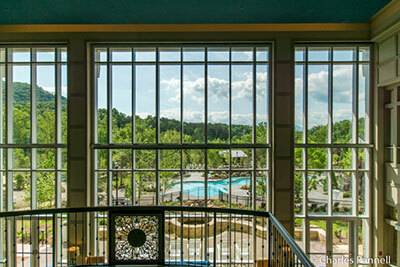 The magnificent two-story lobby looks out over the countryside and offers a commanding view of the Smoky Mountains. You don’t have to stay at the resort to enjoy the view either, as you can always stop by for a bite to eat at the Song & Hearth Restaurant. And as with all things Dollywood, there’s excellent wheelchair-access at Dollywood’s Dream More Resort, with barrier-free pathways to all areas of the property. Although the mountain view is spectacular in the day, the resort also offers a good nighttime view of the Dollywood fireworks during the summer months. 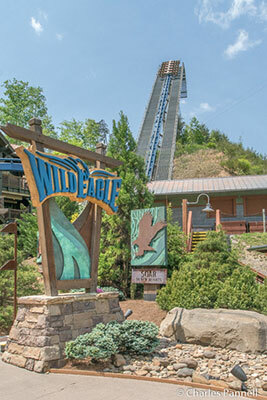 For the ultimate aerial view, hop aboard the Wild Eagle Coaster at Dollywood. Not for the faint of heart, this thrill ride features a 135-foot drop, four inversions and extreme banking. And although it’s not exactly a mild ride, a special harness makes it accessible for wheelchair-users. There’s also a sample seat near the entrance, to help folks determine if this ride will work for them. The steel wing coaster travels over 3,000 feet of track at a top speed of 61 miles per hour; and the best view is from the top, right before the ride takes a 21-story dive. Granted the view is fleeting, and you do have to keep your eyes open, but it’s definitely one that you won’t forget. Editor’s Note: All attractions mentioned in this article were undamaged by the 2016 fires, and they are all open for business.